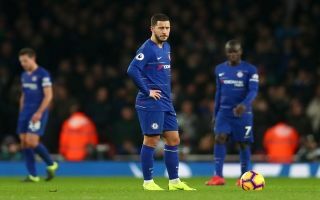 Maurizio Sarri’s Chelsea looked a gear behind Unai Emery’s Arsenal for the majority of this evening’s matchup, the Blues were too passive at times and they paid the price. A look at the goals that Chelsea conceded today say it all about the team’s performance really, there was a obvious lack of fight and desire in the side which allowed Arsenal to capitalise and score twice. Whilst Alexandre Lacazette’s goal can be written off if you’d like for the Frenchman’s excellent footwork and ability to craft a chance from absolutely nothing, the same can’t be said for the second goal that the Blues conceded. Laurent Koscielny – an obvious threat in the air – was left completely unmarked, Koscielny was so confused that he ended up scoring with his shoulder instead of his head. A look back at the footage will show that this wasn’t and individual mistake but in fact a calamitous defensive error. Sokratis picking out Koscielny – who is surrounded by 5 Chelsea players – on the half-volley with the outside of his boot. In no circumstance should a ‘punt’ from Sokratis lead to a goal in this situation – but it did somehow. Five Chelsea players shirked their responsibilities in this moment and the Blues were simply not good enough today. One man who was blasted by Chelsea fans for his performance was summer signing Jorginho, the Italian joined as Sarri’s on-field general for a fee reported to be £57m by the Independent but the midfielder doesn’t seem to be marshalling anything useful for the Blues. Whilst Jorginho’s style of play suits Sarri the problem is that this possession-based style of play simply isn’t working effectively. 90 minutes I’ll never get back in my life. Useless. Jorginho and his coach thought EPL was just smoking cigarette and making 3million passes a season?? Chelsea need a lift and they need it quickly or they could see themselves fall out of the top four which will certainly result in Roman Abramovich giving Sarri his marching orders at the end of the season.